The accomplishment of environmental problems and climate change in particular is a global challenge. We cannot cope with this task alone, but everyone can be part of the solution. iGEM goes green encourages all iGEM teams in 2017 to take part in our campaign for more sustainability in scientific research. This green collaboration is organized in a bidirectional way.  We offer information and guidance and try to set a good example for green lab work, while motivating other iGEM teams to get involved and spread the word. With our GoGreenGuide and the monthly newsletters we provided all the necessary input to get started and the newest updates on our own progress. 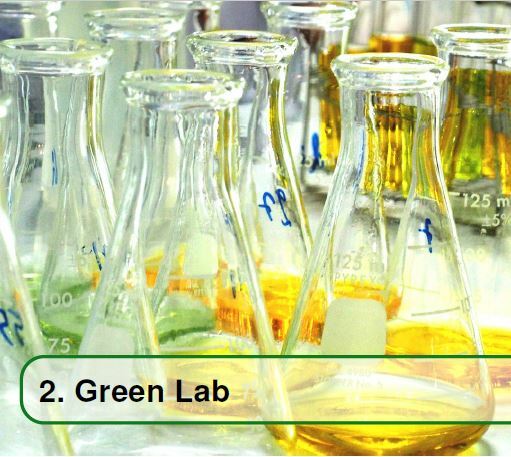 In our GoGreenGuide we offer several possibilities to save energy or consumables during experimental work. iGEM teams willing to participate are admonished to read the guideline, implement some of the advices and also to help extend the content of the current guide. We received input for the guideline from the CCA’s High School iGEM team from San Diego and iGEM Lund from Sweden. Furthermore, we also received input from experts like Kerstin-Helmuth Kleinschmidt from Niub in Freiburg for our GoGreenGuide. We further asked all involved iGEM Teams dedicate a small section on their website to show their implementations of the guideline. This will probably spread the idea of a greener bench work to more and more teams. Click on the map and visit the other teams' go green pages to see all the aspects of green lab work they covered! This year, our team from TU Dresden organized a two-day conference for all German teams. 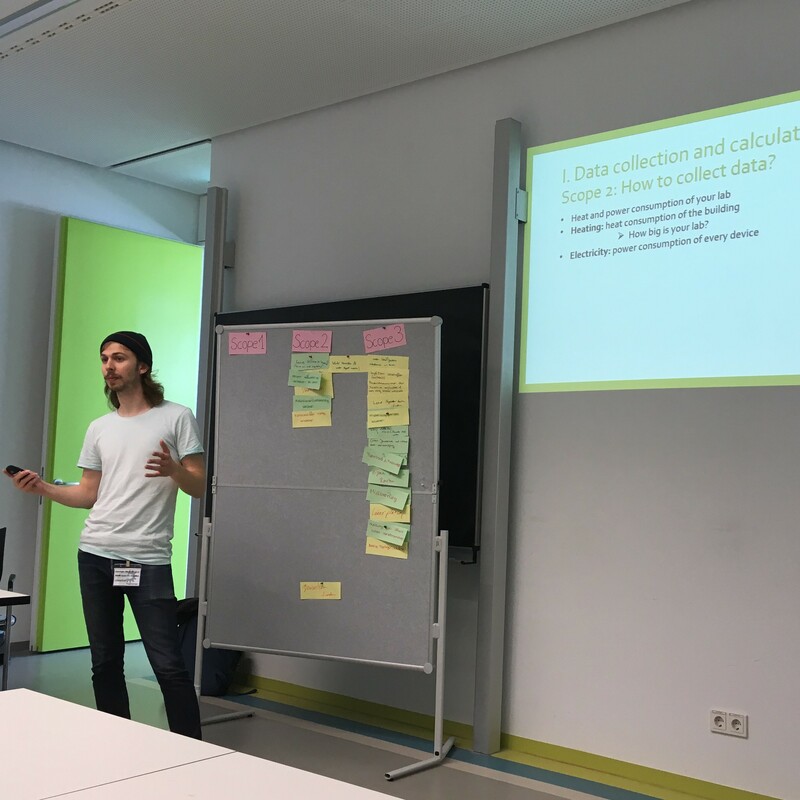 We were very happy that students of nine teams were visiting us in Dresden to share their project ideas and talk about potential collaborations. We saw a great opportunity in this event to inform the other teams from Germany about our vision of iGEM goes green. Therefore, we prepared a workshop giving a general introduction regarding the overall idea behind iGEM goes green. We presented our GoGreenGuide to the participants and showed them how to calculate the carbon footprint of their lab with the help of examples. To make this workshop more interactive, we asked the other iGEM team members to think of potential ways to save energy and consumables. We were excited that some of them were already actively trying to save energy and consumables in their lab. In a short feedback session at the end of our workshop the other teams could share their thoughts about iGEM goes green. We were happy that several teams joined our initiative. During our research concerning greener lab work, we recognized that there is nearly no data on energy and consumables consumption of laboratories. As we liked to measure the greenhouse gas emissions (GHG emissions) the carbon footprint of our experimental work during iGEM, we developed an easy to use excel tool for calculation.  The iGEM Goes Green GHG Emissions Calculator is open access to anybody willing to calculate their labs carbon footprint. We especially offered this tool for other iGEM teams to measure the energy consumption of their devices and to count their waste of consumables for a set period of time (one to two weeks). Afterwards, they just fill in their data into our calculation sheet and the carbon footprint for the whole project is calculated automatically.  We hope to gather data from different labs all over the globe. 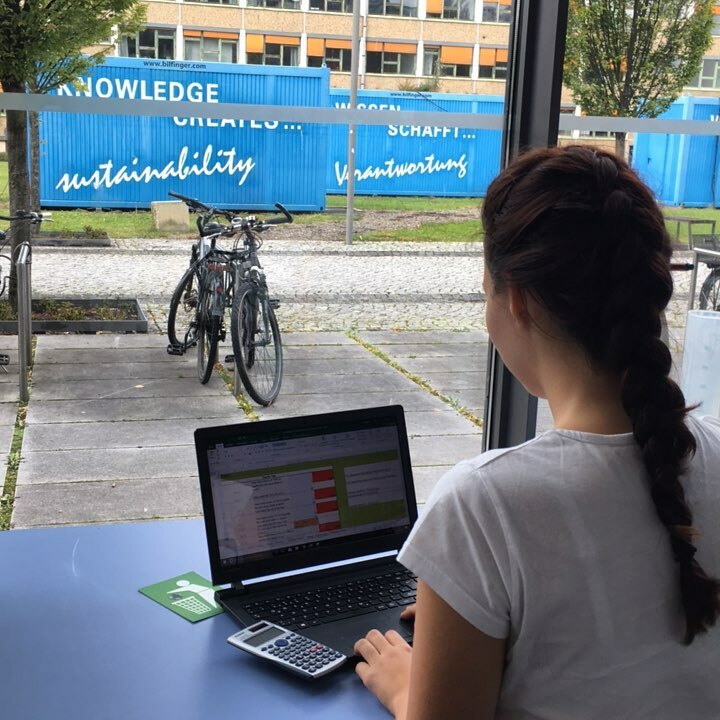 The iGEM Team from Aachen, TU Potsdam and the University of Southern Denmark are currently calculating their labs carbon footprint. We created and designed supporting material for all iGEM teams and research groups interested in iGEM goes green. More explanations to these documents can be found on our Resources page. To discuss details on our iGEM Goes Green collaboration with teams around the world, a skype call is always a great option. We were contacted by the iGEM Team Peshawar and also by the CCA iGEM Team via E-mail. They showed great interest in our initiative, as their project also concerns the environment. 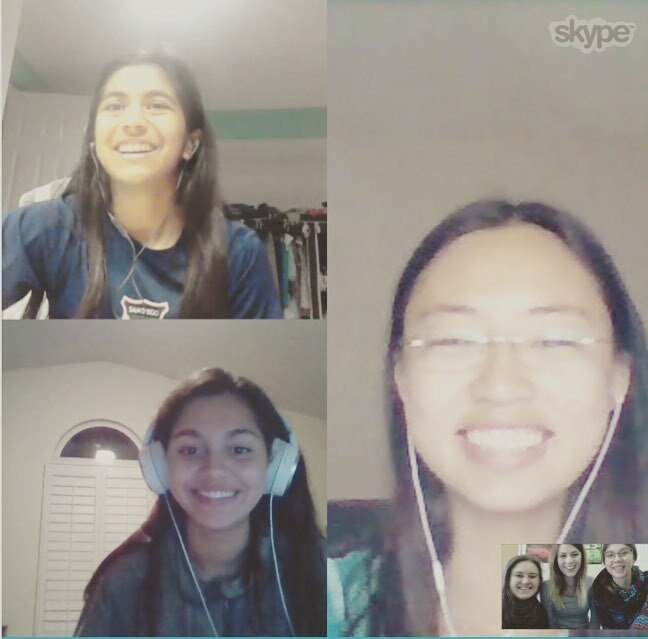 So, we had a skype meeting with the very first iGEM Team from Pakistan and with CCA iGEM from the US. After a shortfirst introduction on our teams and the project ideas, we talked about the tree planting project and also about the opportunities to save energy and avoid plastic waste offered in the GoGreenGuide. It was very nice to chat with them, answer some questions and to receive some further input. The iGEM Team from Düsseldorf-Cologne offered a postcard collaboration this year. 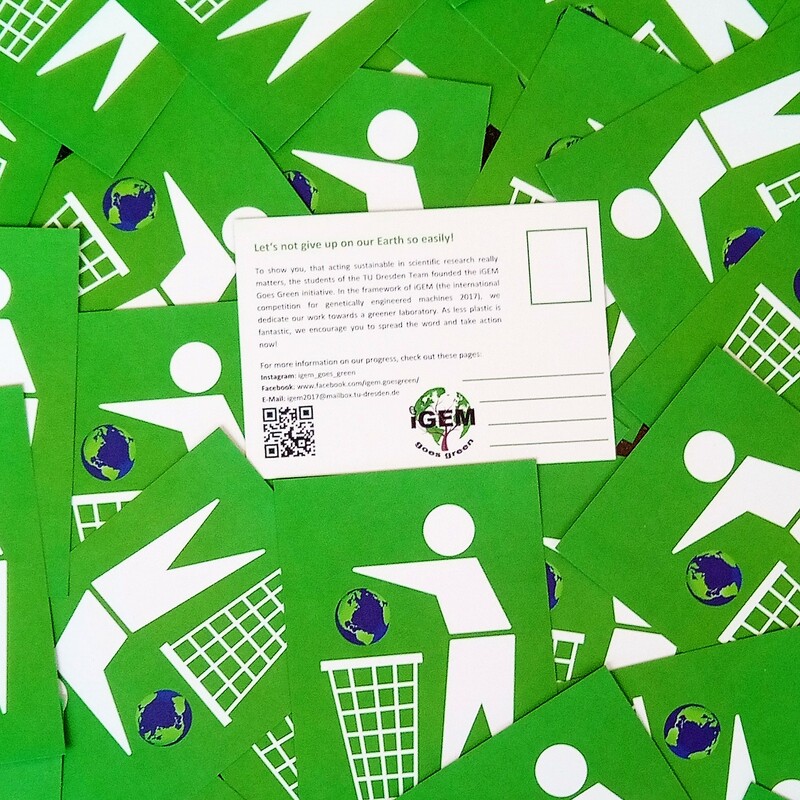 We liked this idea very much and designed a special postcard for iGEM goes green (on recycled paper) to spread the word! 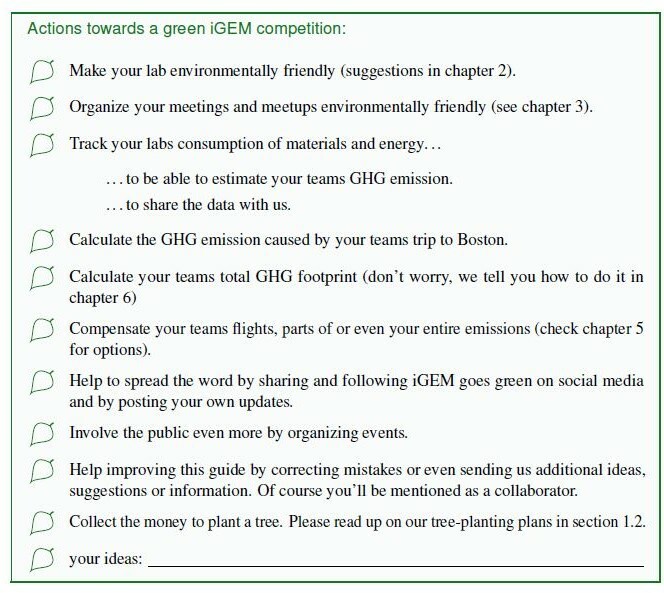 As a symbolic act of sustainability, we were encouraging all iGEM Teams to plant a tree as a compensation for the green house gas emissions produced due to our flight to Boston and back. So far, iGEM Peshawar, the Team from Southern Denmark and CCA`s iGEM Team ensured us to plant a tree. 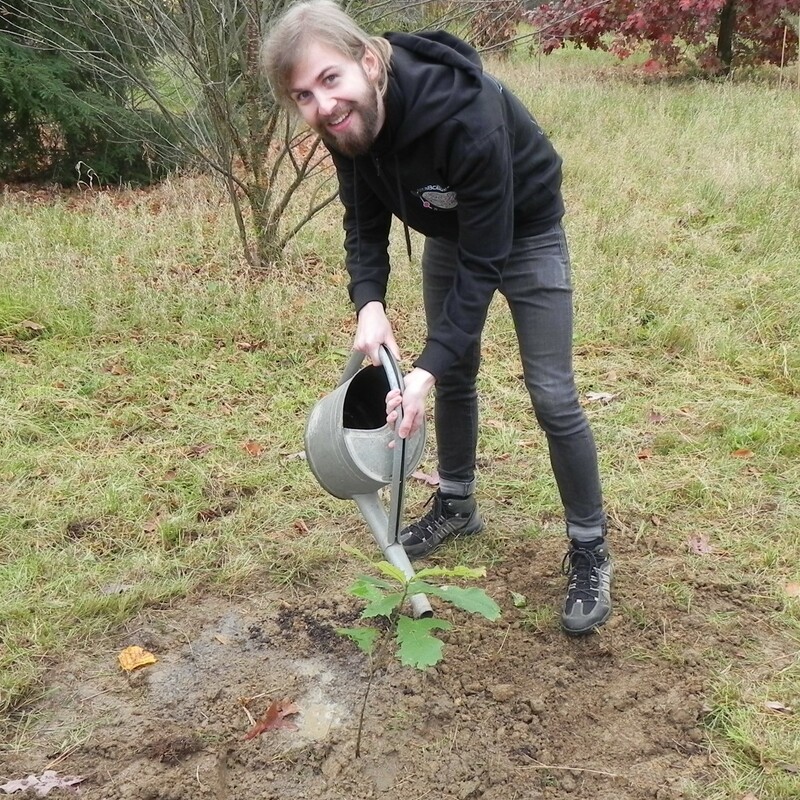 Our own team planted a tree (Quercus macrocarpa) in the Forest Park Tharandt near Dresden. This video is a trailer for iGEM goes green. You can watch it here: http://2017.igem.org/wiki/images/0/09/T--TU_Dresden--GG_Video_Darmstadt.mp4 .